Results of the sled chicken photo caption contest! The neighbors complained so much about the dogs barking...wait 'til they hear the "rooster" crow! 2. Perhaps we have been adding too much chicken to their diet??? 3. Don't laugh, the guy who sold me these told me the one on the left was sired by Saunderson's Victor. There were so many great entries that we decided to award ads to the top three captions. Judging by the number of votes received, everyone enjoyed the contest. Thanks to everyone who played along with our little joke! 2. I don't think the doghouses are the whole problem. 3. There's them racin' chickens ya'll carry in them there boxes on ya truck. 4. Free food and lodging. 5. For sale: racing chickens. Great sled pullers and will give you breakfast on the trail. 6. Don't laugh, the guy who sold me these told me the one on the left was sired by Saunderson's Victor. 7. 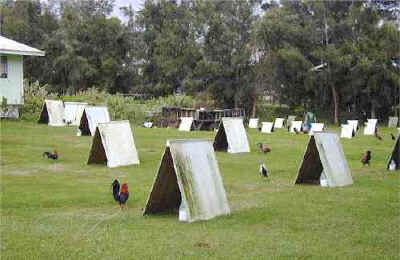 The chickens were a lot harder to train, and finding a leader in the lot was a real challenge. Still, Dave thought, they did smell a fair bit better than the pigs had. 8. This team has been Hen Picked. 9. I say boy, I say boy, isn't it about time we get out there and pull a sled around a bit. 10. Chickens don't have nuggets!!! 11. Perhaps we have been adding too much chicken to their diet??? 12. Famed musher Doug Swingley changed to Rooster mushing after crushing Iditarod defeat. 13. Extreme out-crossing has severely pushed the limit of the Northern Dog rule. 14. The neighbors complained so much about the dogs barking...wait 'til they hear the "rooster" crow! 15. When the grass goes green and I park the team, some get stocky, but they all get cocky. 17. Euro /hens -- look no stake outs. 18. Another failed attempt at outcrossing, but at least they taste like Chicken!! 19. Wonder which ones the leader? 20. A chicken in every pot. Thanks for the smiles everyone! We'll have to have more of these contests!